For a lot of us, just thinking about the Super Bowl elicits a craving for deep-fried goodness. If you're without a dedicated fryer, don't fear. Modernist Cuisine at Home will show you how to achieve the same effect with a handful of conventional kitchen tools you just might have lying around. Modernist Cuisine at Home, which launched as a $79.99 app in November, now has a free preview version. They're sharing some of the content from the paid version exclusively with Gizmodo, and this week they're helping us prep for Super Bowl parties. 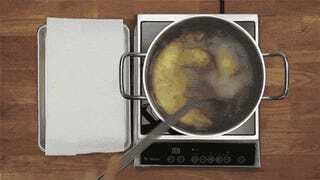 We're big fans of deep-frying as a finishing technique after cooking sous vide. You don't need to own a dedicated fryer. You just need a deep pot and the proper tools to insert and retrieve the food from a safe distance: long tongs, a slotted deep-fry spoon, or a frying basket. 1. Choose an appropriate frying oil. Peanut, soybean, and sunflower oils are our favorites for frying at high temperatures. 2. Add the oil to a deep pot, but fill it no more than half full. Use enough oil so that you can submerge a small batch of food completely. 3. Preheat the oil to the cooking temperature (temperatures listed in the recipes below). For consistent results, cook in small batches to minimize the cooling that occurs when you add the food, and warm food to room temperature before frying it. 4. Pat the food dry with paper towels. External moisture causes the oil to splatter. 5. Deep-fry the cooked food. Just 30 seconds may be enough when you don't want to further cook the interior of the food. Allow the oil temperature to recover between batches. 6. Drain the food on paper towels. Absorbing excess oil removes much of the fat. Head over to Inkling to learn more about the Modernist Cuisine at Home app, or straight to iTunes for the Paid and Free versions.